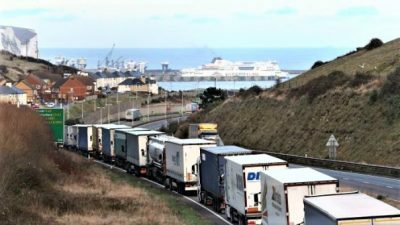 The FT reports that David Lidington, Mrs May’s de facto deputy, has briefed the cabinet that under a no-deal Brexit, the Dover-Calais route could be running at only 12-25% of its normal capacity for up to six months. This would force Britain to seek alternative ways of bringing in “critical supplies”. Chris Grayling, transport secretary, has discussed with government colleagues the possibility of chartering ships, or space in ships, to bring supplies into other British ports, thus avoiding the Dover-Calais bottleneck. Government officials say they do not expect to have to use legal powers to requisition ships, although with only five months to go until Brexit on March 29, there is little time to charter ships on the open market. According to the FT’s George Parker and James Blitz this move was greeted with disbelief at a stormy meeting of Theresa May’s cabinet on Tuesday. The prime minister announced there would now be a weekly cabinet discussion on preparations for Brexit, whether under a deal or no-deal scenario. If Britain left the EU under World Trade Organization rules, the UK and EU would be in different customs jurisdictions and would be expected to carry out checks on trade across the English Channel. Some 30% of all Britain’s food requirements are met from imports from other EU countries; Dover is a key port of entry, with over 2.5m heavy goods vehicles passing through the port each year. “Ministers say that disruption would also damage EU companies and that there would be political pressure from member states for the European Commission to mitigate the most damaging aspects of a breakdown in talks”. All images in this article are from Political Concern.